The disused garage which had been an eyesore in the village. Looking at the busy food hall/coffee shop today, you can appreciate the vision of farming families Mike and Liz Barker and their neighbour Richard Halhead. The new building, designed by Lancaster's Mason Gillibrand and built by Whittington firm Fred Hall & Sons. When they first came across the site it had been a derelict garage for years and something of an eyesore for the village. 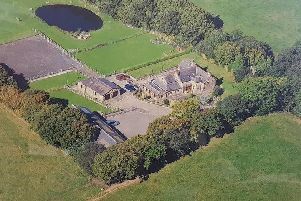 The Barker/Halhead families had been looking for a site where they could sell some of the meat they reared at Cockerham, Lancaster, and, although it was an hour’s drive from their farms, they knew it would work. Spurred on by their friend Mark Birkbeck, of the House of Bruar, they bought the site, demolished the old pre-fab building and removed the petrol tanks. Within 18 months it had opened, selling local food, crafts and clothing. Richard Halhead (seated at the front) with some of the Country Harvest team. Country Harvest soon became a byword for local produce and some of the lines they stocked in the early days have gone on to prosper, including Cartmel Sticky Toffee Pudding and Hawkshead Relish. Just before the worst recession in UK history they decided to sell and in 1998 Mike Clark and Gay Penn bought the business and set about making a few changes. When Cumbrian-born Mike Clark took over he invested in all parts of the business; the Food Hall was overhauled; the Gift Hall refurbished and, although the Coffee Shop retains a traditional feel, it also had a major makeover. “We don’t do something here unless we know we can do it well,” said Mike. One of the biggest challenges to the business - which has seen profits rise every year during the past decade – was in 2017 when they invested £250,000 in a new Christmas Cabin. Mike Clark, when he bought the business 10 years ago. “We knew the time was right for expansion and after years of discussing it we decided to take the plunge,” said Mike. The Christmas Cabin was a huge success and re-opened last month with even more trees, lighting and decorations. Over the years Country Harvest has continued to evolve, from holding Dine & Shop evenings where customers have the place to themselves to full-on foodie events. This year to mark the 25th anniversary the Food Hall staged a baking competition in a marquee in the grounds with TV’s Great British Bake off winner Nancy Birtwhistle as the judge. “We wanted to do something really special for our silver anniversary and that was it,” said Mike. Mike Clark with Great British Bake Off winner Nancy Birtwhistle and Country Harvest co-owner Gay Penn. “Country Harvest has been thriving for a quarter of a century and myself and the team are determined that it will continue to develop. “I’m proud to say that many members of staff are still with me, they are key to everything we do here as customer service is our number one priority,” said Mike. Every year Country Harvest staff raise money for a chosen charity, last year it was North West Air Ambulance.